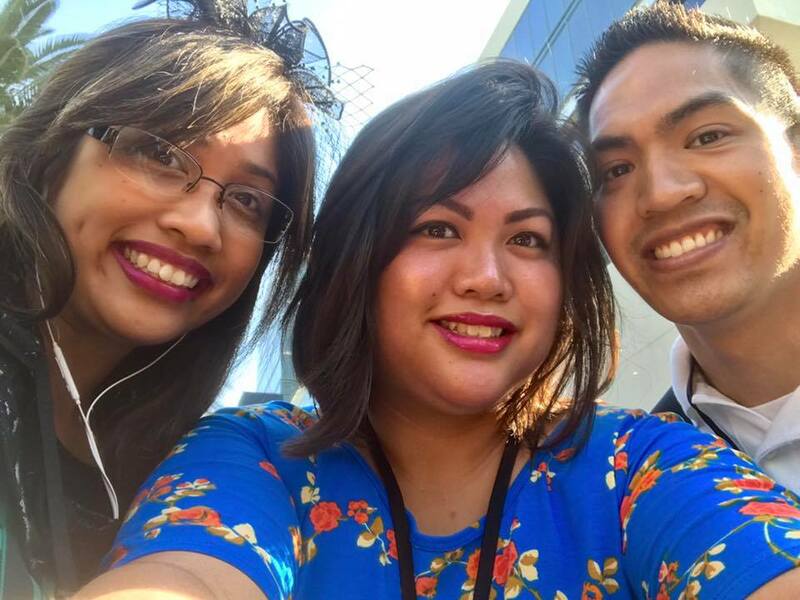 We survived our first D23 Expo! When we say survived, we mean WE SURVIVED. We read a ton of information online before our trip. We wanted to know it all – the good and the bad. There was so much information out there that it became overwhelming instead of being helpful. We didn’t want to be disappointed by over-hyping the event, so we decided to go into the Expo with low expectations and lots of optimism. We’ve compiled a few tips that we hope you’ll find helpful. 1. Stay nearby. It was so convenient to be within walking distance of the convention center. We stayed at Disney’s Paradise Pier and it was about a 15 minute walk to get to the center. It was nice not having to worry about parking. See the parking rates and information about the various parking lots on Anaheim Convention Center’s website… It was enough to deter us from thinking of driving! 2. Wear comfortable shoes. Your feet will thank you! 3. Be prepared for long lines and lots of waiting. We knew there were going to be a ton of people there and I’m so glad we mentally prepared ourselves for it. The crowds were unlike anything we’ve ever experienced before. We waited 2-3 hours each day just to get into the venue, but the lines don’t stop there. There are lines for everything – to go into the exhibits, to go into the stores, to purchase food, to go into the restroom. Some exhibits had minimal wait as the day went by and some exhibits always had a long line (for example – Scrooge McDuck’s Money Bin always had a line!). 4. Bring portable batteries so you never run out of juice. We are so glad they had Wi-Fi at the Anaheim Convention Center. Having wireless data access helped make the time pass by while we were waiting in line. It was spotty at times, but I was so grateful to have it. 5. Bring bottled water. Save money and bring your own bottled water! The letter we received before the Expo said that food and drinks were not allowed, but bottled water is the exception. We also brought light snacks with us and weren’t reprimanded. I was hoping that there would be Disney food at the convention and unfortunately that wasn’t the case! We ate at the Anaheim Convention food courts… The meals were expensive and tasted less than mediocre. There were food trucks at the convention too, but there was a long line to get back through security. We decided to dine at the food trucks for dinner instead. The food trucks were expensive too, but at least the food offerings were plentiful and flavorful. 6. Prioritize what you want to see. Especially when it comes to the panels. Some people wait hours to get into the highly coveted panels, such as the Walt Disney Parks and Resorts panel. While it would have been AWESOME to be there in person and feel the energy of excitement from the crowds, to us it wasn’t worth waiting 4 or 5 hours. We saw all the updates on Twitter, Facebook, and Instagram while we were doing other things, so we don’t feel like we missed out on anything. We wish they presented panels multiple times throughout the Expo, but they don’t. 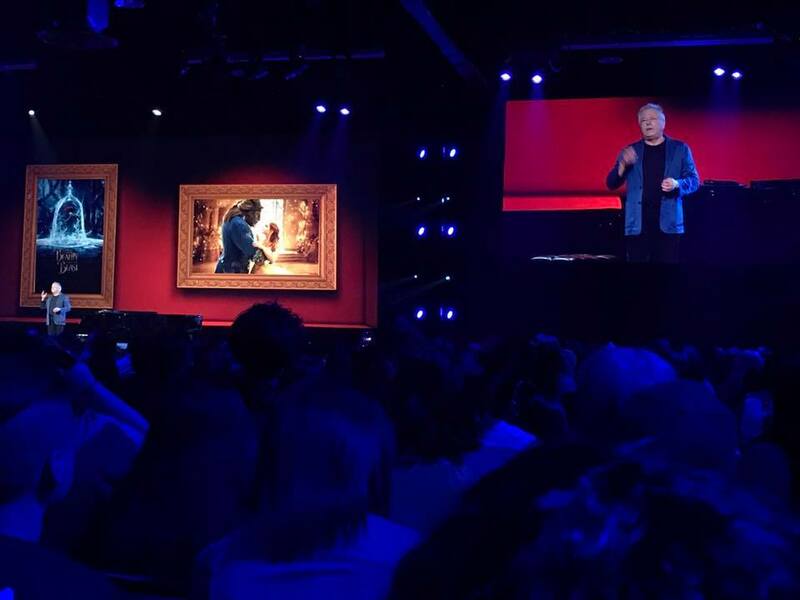 The only presentation that had 2 sessions was A Whole New World of Alan Menken (which was AMAZING!). 7. 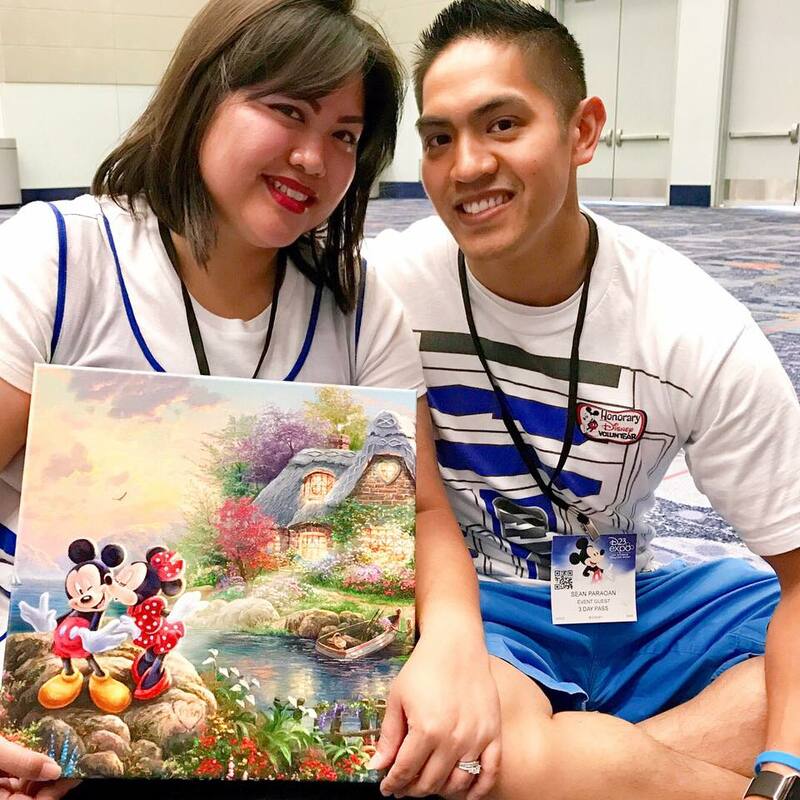 Save money and leave room in your suitcase for D23 Expo exclusive merchandise. 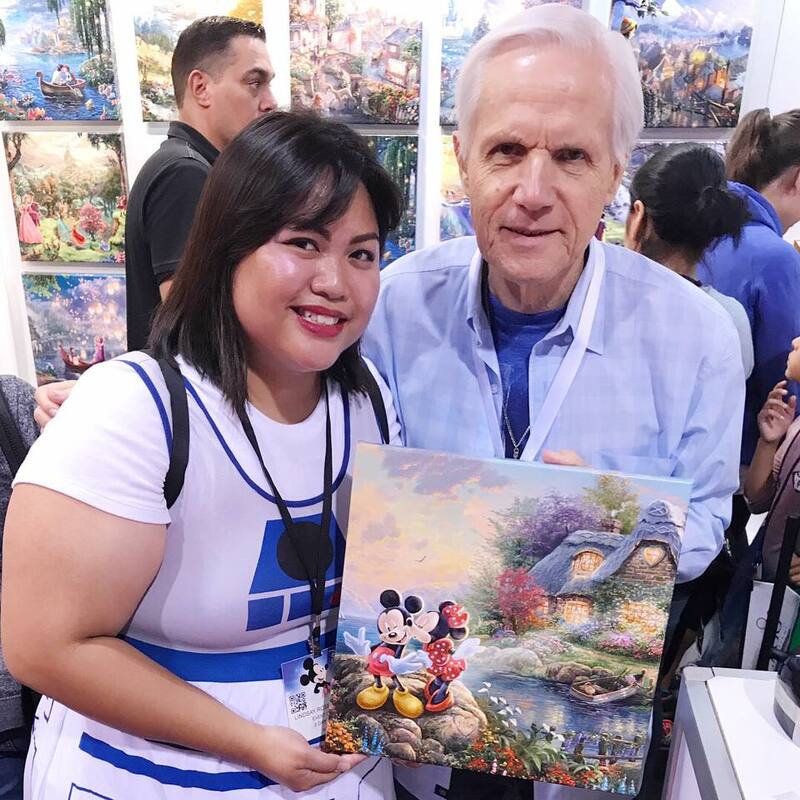 There were a ton of cool D23 Expo exclusive merchandise! The lines to get into the Dream Store and the Disney Store was always at least 45 minutes long to get in. We didn’t buy a lot of things, but we saw people with BAGS AND BAGS of stuff. American Tourister hosted a bag check area and I believe their fee was a reasonable $2/bag for them to hold. 8. Beat the heat – bring a personal fan. We just used paper fans and they worked great. They don’t take up a lot of space and you don’t need batteries for them. We bought 3 day tickets during the Early Bird special. 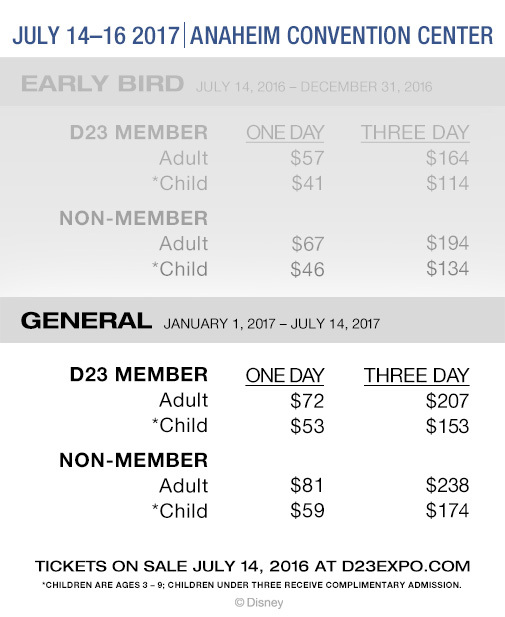 I don’t see why anyone would pay for non-member pricing, signing up for the basic tier of D23 is free! They also have premium “Sorcerer Package” tickets which are pricey at $2,250/ticket. Not sure how many of those tickets are available, but we heard that they did indeed sell out. Check out what is included on D23. Have you ever wondered who the voices behind your favorite Disney attractions are?! This was such a magical experience! My little sister’s favorite ride is “It’s A Small World” and her face lit up when she saw the narrators of the attraction – B.J. Ward and Yeni Alvarez. We also saw Bill Rogers and Camille Dixon. We loved seeing the dynamics between all of the presenters! View the video on YouTube, uploaded by Inside the Magic. 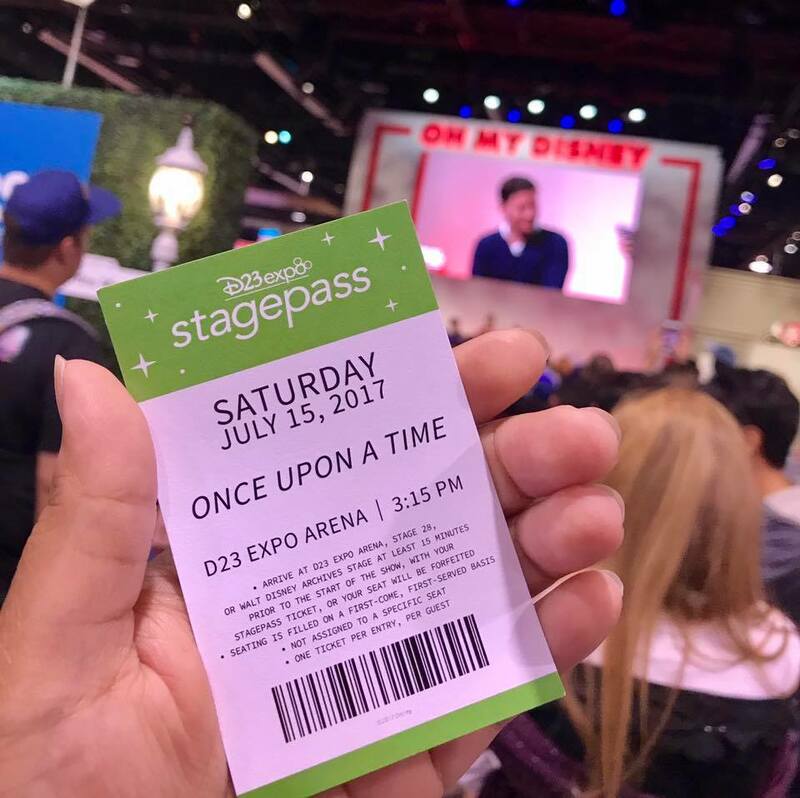 Once Upon a Time panelOne of our favorite shows of all time is Once Upon a Time. 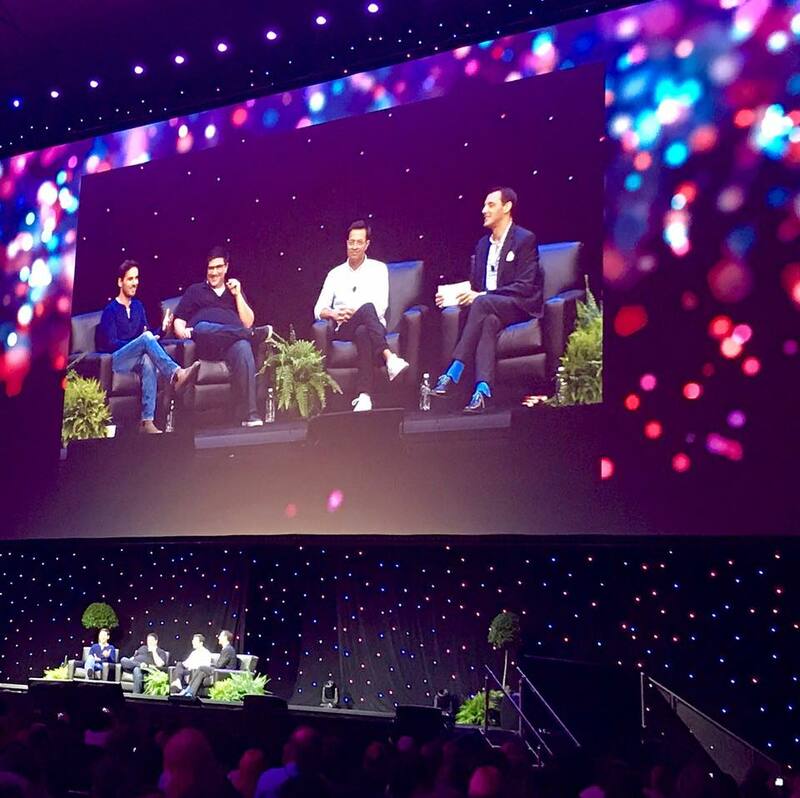 There was no way we were going to miss this panel! The stage host was Jeffrey Epstein and Colin O’Donoghue, Edward Kitsis, Adam Horowitz graced the stage. It was a cool treat to see Colin sing his song from he Musical episode. 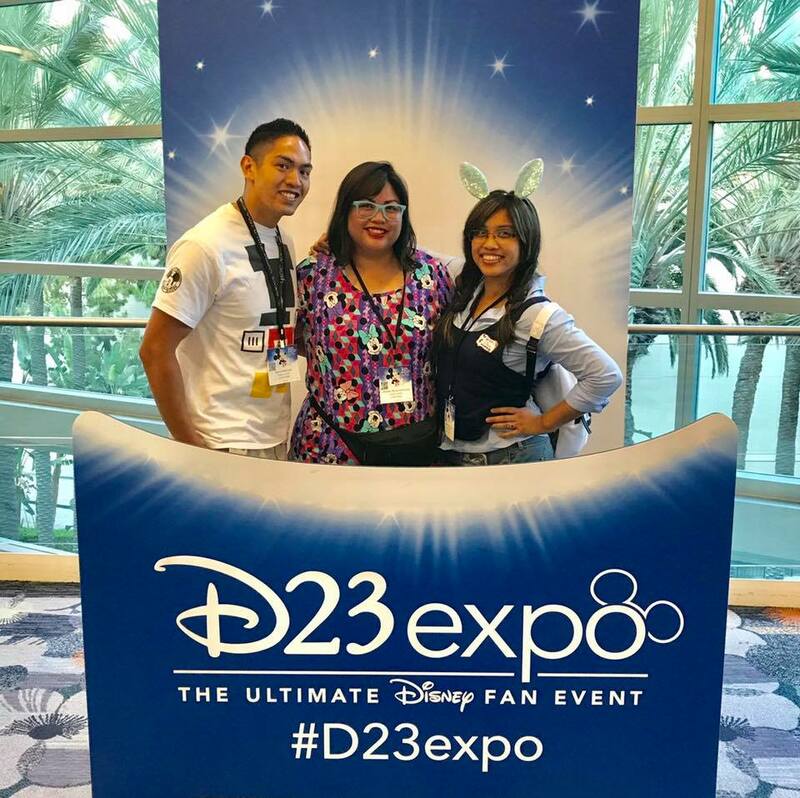 D23 has a great review article on their site and Disney Dwayne uploaded a highlights video on YouTube. The Alan Menken performance was a once in a lifetime experience. Never in our lives did we think we’d get to witness Alan Menken perform in person. He wrote music for The Little Mermaid, Beauty & the Beast, Aladdin, Newsies, Hercules, Tangled, etc.! It was neat learning about his life and learning how some of the greatest songs came to light. Okay, I (Lin) have been following Charis on various social media platforms for a while now. My sister and I have always admired her optimism for life. She lives in Alaska too! In North Pole. 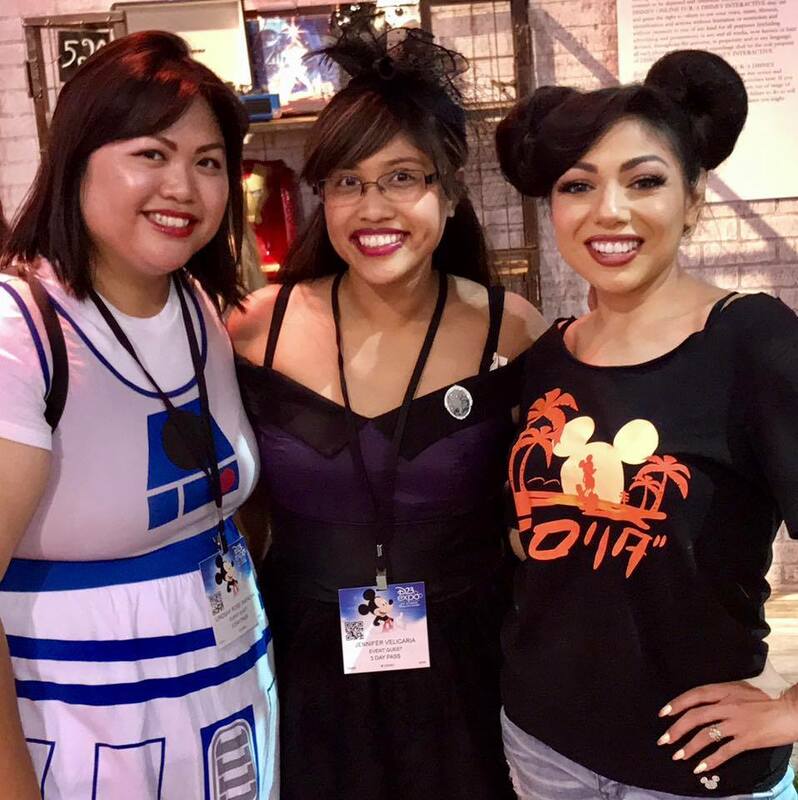 We’ve always wanted to meet her and we got our chance at the D23 Expo. She is just as bubbly and warm in person as she is in her YouTube videos. If you need a daily dose of positiveness and happiness, definitely check her out! 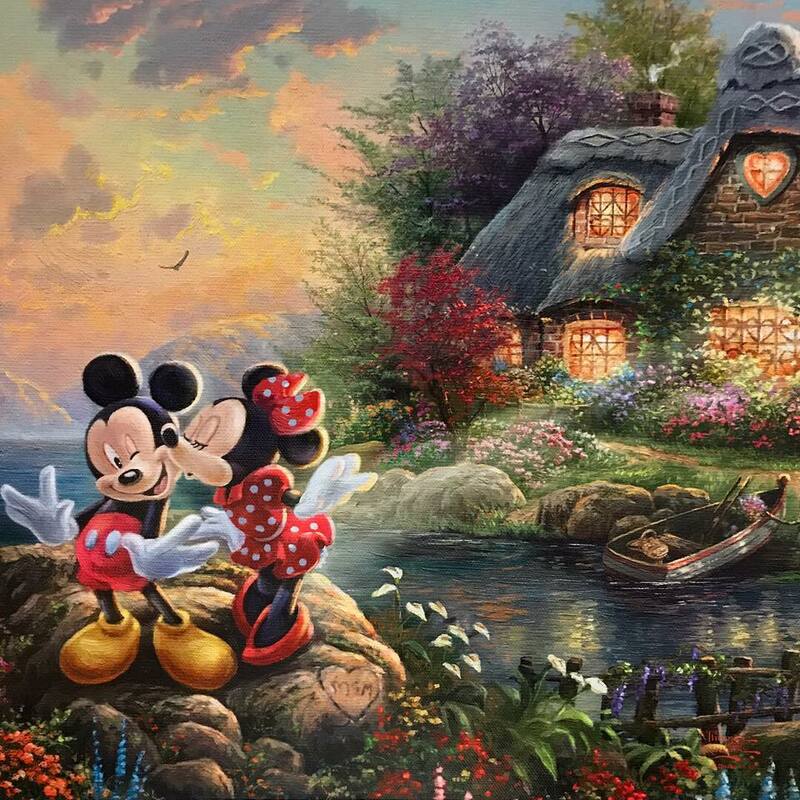 We have several Thomas Kinkade canvases and we added this Mickey & Minnie Mouse canvas to our collection! 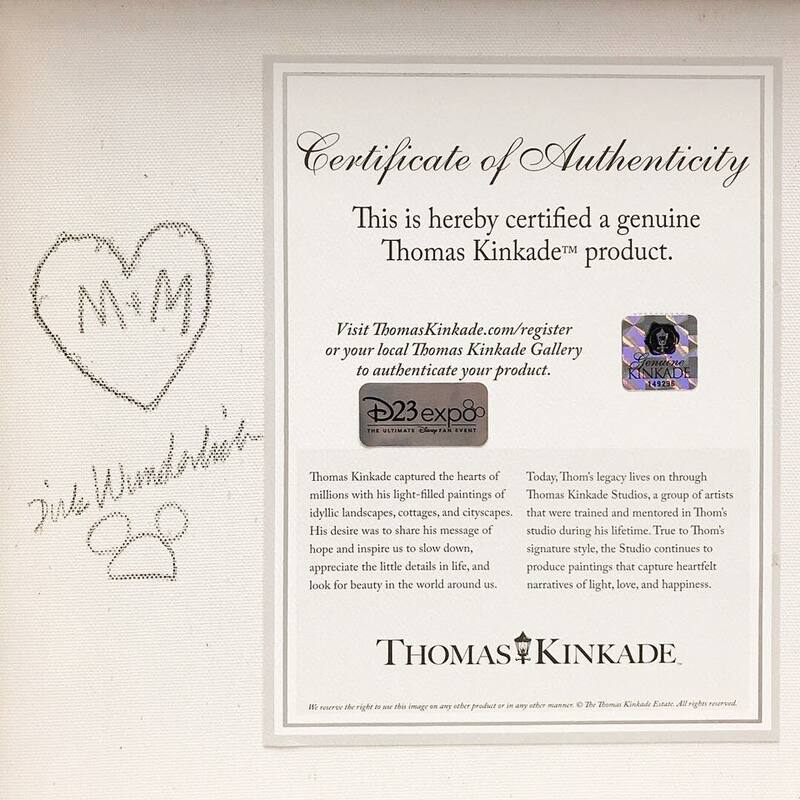 Thomas Kinkade Legacy artist, Dirk Wunderlich, even signed it. There were plenty of fun photo opportunities all over the place. I really wanted one of these famous Pixar balls! Don’t let Olaf steer your sleigh! There is definitely more room for improvement. 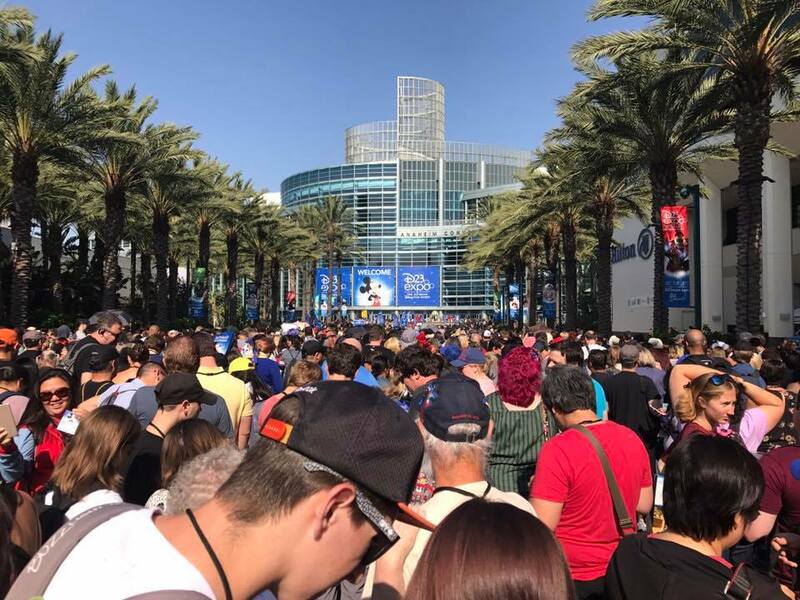 Our suggestions that could have made the experience better: have a more efficient crowd control system, show panels multiple times throughout the schedule, and tell Anaheim Convention Center to serve better food. We had a great time overall and we look forward to going again in 2019! The best explanation of DVC (Disney Vacation Club) is that it’s a vacation ownership program. Dare we say it – yes, it’s Disney’s version of a timeshare. You’ll never hear themselves promote it as a timeshare though. Many timeshares have a poor reputation and people often dismiss the idea once that dreaded word is mentioned. While that feeling is understandable, if you love vacations – especially vacationing at Disney destinations, you may fall in love with Disney Vacation Club like we did. They call it DVC for a reason – you really feel like you’re part of a club! There are 16, most of which are located on Walt Disney World’s property. Each are uniquely themed and immerse you into the stories they represent.Check out Disney Vacation Club’s official site to see more details about each individual resort. You purchase a set number of “vacation points” that are allocated each year until the contract expires. The expiration date depends on your home resort. Some contracts end as early as 2042 and some end 2062. You use your allotment vacation points to “spend” on accommodations. The number of points per night will vary based on what resort you stay at, the kind of room you want (studio villa, 1 bedroom villa, 2 bedroom villa, etc.) and when you decide to go. Disney Vacation Club has 5 distinct seasons – Adventure Season, Choice Season, Dream Season, Magic Season, and Premier Season. We kind of like to equate the Adventure Season as the “value” season whereas the Premier Season is “peak” season. As you can see, there is a big difference between the Adventure and the Premier Seasons. We like to maximize our points by staying in a Studio Villa and going during the Adventure Season. An important choice to make is where you want your home resort to be (aka where you buy your contract). It is important because you can book to stay at your home resort 11 months in advance. You can book 7 months in advance for the other resorts. You can also exchange DVC points to use at RCI accommodations! RCI is another well known timeshare company that has hundreds of resorts around the world. We personally haven’t used our membership to stay at non-Disney properties, but it’s cool that we have that ability to do so in the future. If you don’t use all of your points in the current year, you can “Bank” them into the next year. It’s a nice perk since some timeshares have a “use it or lose it” mentality! Another neat feature of DVC is that you can borrow points from the following year. Studio villas are a little bigger than regular hotel rooms and feature a balcony and a well-equipped kitchenette (microwave, fridge, coffee maker, sink, paper plates, utensils). The larger villas have a fully-equipped kitchen (stove, oven, real plates and utensils, etc.) and an in suite washer and dryer. Membership benefits! You shouldn’t buy into DVC for the perks, but they sure are nice. Some perks include discounts and member only events. There are discounts on tours, merchandise, special ticketed events, and occasionally even offer specials for theme park tickets. Flexibility and lots of choices. Even if you are staying in a Studio Villa, you can get tokens to use the common area washers and dryers at no extra fee. You don’t have to pay for parking. All of the perks of staying on property – Magic Mornings, included transportation, the “Disney touch,” etc. Vacations and new memories year after year. Cost. We’re not going to sugar coat it, it is expensive. But what you are getting are countless memories to last a lifetime – and that to us is worth justifying the costs! This doesn’t bother us much, but it may bother other people… Since DVC is meant to be a “home away from home,” you don’t get daily mousekeeping service. YOU MUST BE A PLANNER. Again, this doesn’t bother us much since we love planning ahead. We suggest booking right at the opening window for your best chances at getting what you want. Unfortunately, resorts like the Grand Californian are always difficult to secure since there are only 48 villas total. Possibilities of annual dues increasing. Yes, there are annual dues. Why did you join Disney Vacation Club? We’ve always been a Disney couple. When we learned about Disney Vacation Club, we knew it was something that we wanted to be apart of. We love vacationing, especially on Disney trips. We love the perks of staying on property. We love the immersive theming and the impeccable customer service. We love the perks. We love taking our family and friends along. We don’t have kids yet, but when that time comes we want them to love Disney just as much as we do! We suggest checking out Disney Vacation Club’s official site! You can also order a free DVD guide. We hope that this gave you a better insight of what DVC is. Feel free to ask us any questions!